The second issue of the Arte Maya Tz'utuhil Newsletter was slower in coming that I had hoped. I get a lot of email I don't want, and I decided I would rather wait until there were enough items of interest or importance to report on. I have been to Guatemala twice since the last newsletter, and frequent visits seem to keep the artists inspired and doing their best work. I got the first draft of my book on the artists done before I left for Guatemala, and now I am getting ready to start looking for a publisher. 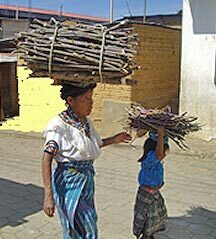 NGO helps the women of San Pablo la Laguna, one of the poorest Maya towns. Mahiya Norton, an Australian woman, came to Guatemala and learned Spanish in order to set up a program to help some of the poorest indigenous women. She decided on San Pablo la Laguna, a Tz'utuhil Maya village. The project began by building stoves for the women of the town. This conserves fuel and makes a healthier environment for the women who no longer have to breathe the smoke from open fires. Other projects of the organization include teaching women Spanish, humanly dealing with the cat and dog problem, giving the women micro-loans, and giving classes and access to sewing machines. The program can use volunteers. You can find out more on their website, Amigos de Australianos y Zelandeses. Sales of the Arte Maya calendar help support my work with the Maya artists. As always the calendar is in English and Spanish and includes photographs and biographies of the twelve Maya artists whose paintings appear in the calendar. The Maya Glyphs are included for each day of the year. A brief description of how the Maya calendar works is included at the front of the calendar. There are very few women artists, but the calendar includes paintings by four women artists—two Tz'utuhil women and two Kaqchikel women. Don't be disappointed. Every year we have run out of calendars by the end of the year. If you buy more than two, the price per calendar goes down. 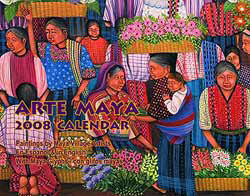 Order the calendar on the Arte Maya website. 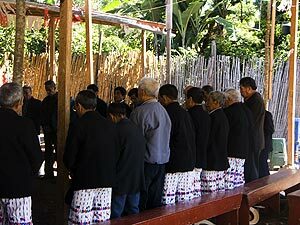 Until it's demise during the 1970s, the elders of cofradía system selected the town's mayors. Now the mayor is voted upon by all the residents who are of age, and the mayor is selected among candidates of various (national) political parties. Whereas the town remained unified under the cofradía system, elections have become very contentious, sometimes violent, and the municipal government only helps those who belong to their party. Chico Mendoza has pledged to help all the people of San Pedro and once again unify the town. Hopefully he can do that. In the photo, the elders of the town arrive at Chico Mendoza's headquarters after the election to give their blessing to the new mayor. 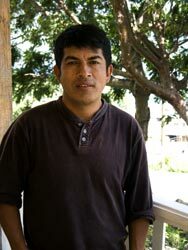 Chico Mendoza is the brother-in-law of Tz'utuhil Maya artist Pedro Rafael Gonzalez Chavajay, whose painting appears in the masthead. 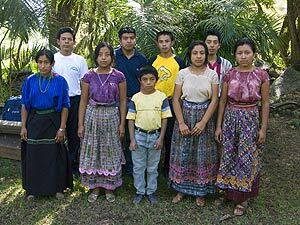 Scholarships help students from impoverished Maya families to finish high school. I have worked with Tz'tuthil Maya artists for over twenty years now, and I have always tried to treat the artists fairly, giving them a just price for the paintings they do. 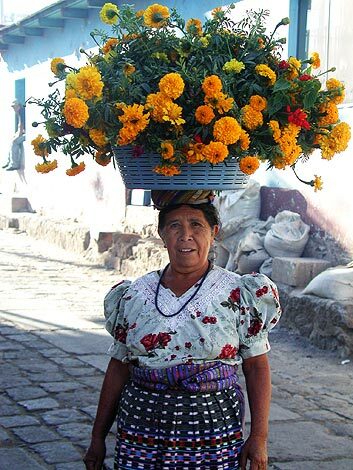 I have always paid them considerably more than the galleries in Santiago Atitlan do. This year I decided to apply for Fair Trade status. When I got the application, it became apparent that artists are different from coffee workers or weavers, in that the prices they command depend on the quality of their work and their reputation, not how many hours they put in. This got me thinking about how Fair Trade would work for the artists and to me. To me the most important aspects are originality and quality. 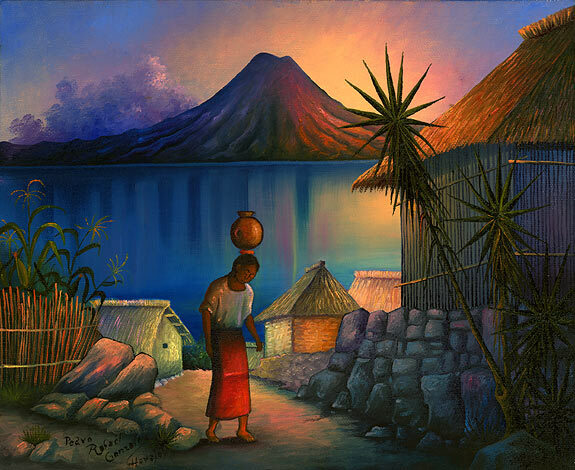 The galleries in Santiago Atitlan have been a help to the artists (steady income) and a hindrance (sacrificing quality for speed). Mario Gonzalez Chavajay, pictured on the left, came to work with me after many years of working for the galleries. For three years we had good, but sometimes troubled relationship. I , unsuccessfully, tried to get him to paint more slowly. In January of 2007 we stopped working together because we couldn't agree how. Meanwhile, I was thinking about what fair trade means. The artists who do the best work are not in a hurry to sell their paintings. I can buy their work directly from them if I visit twice a year. They usually had other sources of income too. When I returned this year in September, Mario and I talked and found a way to work together. Mario earns all his money from painting. Mario had been calculating how many paintings he had to paint each month to earn enough for his family to live on. The solution was that I offered to pay him a salary each month that would allow his family to live comfortably. In exchange I would get all his paintings. He would also paint more slowly, take some time off for inspiration, and paint only original themes. He did a small painting for me before I left Gautemala, and it is one of the best in terms of theme and quality of painting, that he has ever done. My hope is that this method of working together will raise the quality of Mario's work to the next level.